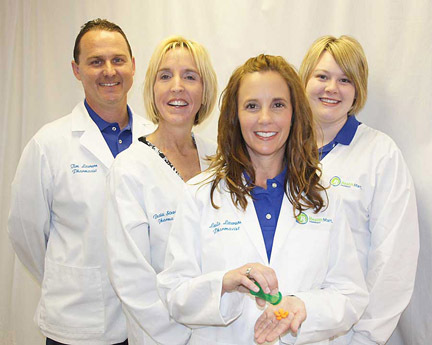 Your January Bee Healthy Tip from the trusted team at Metropolis Drugs II: from left: Tim Lawson, Dacia Stewart, Leslie Lawson and Lauren Scott. It’s certainly not a cure-all. But it’s pretty impressive. In no time at all, you may also notice other subtle changes from exercise: more energy, less stress, firmer muscles, better-fitting clothes.1 Some pretty nice bonuses, don’t you think? In other cases, short bursts of high-intensity exercise may have greater benefits. A new Canadian study suggests it might help people with type 2 diabetes more than longer sessions of less intensity activity.4 Participants in the high-intensity group had twice the improvement in blood sugar levels as those in the low-intensity group. Why is this so? Researchers aren’t sure. The higher- intensity workouts may use energy in a different way. Another plus? People can fit this kind of workout more easily into their busy schedules. Walking tips. So what kind of exercise should you do? The possibilities are endless. Look at your daily routines for how to incorporate more walking, for example you could walk up the stairs instead of using the escalator or you could set up a walk schedule with a friend. For many people, walking is a great choice. It’s easy to do and doesn’t need to cost a dime. Now, that’s a cost-effective approach to aging and fighting disease! Warm up by walking slowly for the first 5 minutes. Use long strides, but walk at a comfortable pace for you. Swing your arms, point your toes straight ahead, and keep your back straight and head up. End your walk at a slower pace. No matter the exercise program, start slowly, especially if exercise is new to you. Before you begin, talk over your plans with your doctor or with us. 1. WebMD: 10 Fitness Facts. Available at: http://www.webmd.com/men/features/exercise-benefits?page=3 Accessed 12-1-15. 2. HealthDay: The Physically Active Less Prone to Post Heart-Attack Depression. Available at:https://www.nlm.nih.gov/medlineplus/news/fullstory_155572.html Accessed 12-1-15. 3. HealthDay: Physical Fitness Linked to Mental Fitness in Seniors. Available athttps://www.nlm.nih.gov/medlineplus/news/fullstory_155694.html Acessed 12-1-15. 4. HealthDay: Short Bursts of Intense Exercise Might Benefit Type 2 Diabetics. Available at:https://www.nlm.nih.gov/medlineplus/news/fullstory_155644.html Accessed 12-1-15.
to help keep you and your family healthy! This entry was posted in All the Buzz - Bee Informed, Bee Healthy and tagged Exercise, Metropolis Drugs II on January 6, 2016 by massacbeeswax.